Bangalore, September 22, 2017: Sarala Birla Academy School emerged winners for the Art & Design competition – ‘Chiaroscuro 2017’ – organized by Legacy School at its Hennur campus. 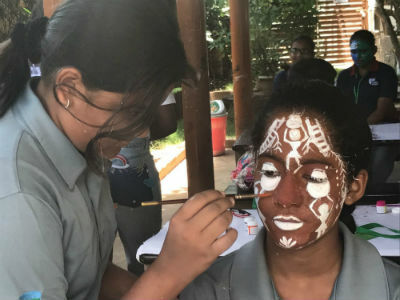 The contest was conducted to provide a platform to the students with an artistic talent and exhibit their creativity using the medium of their own choice. With this year’s theme as ‘Aeonian – Timeless Art’, the institute invited schools across the city to be a part of the mega fest. The competition categories included – Photography/ Videography, Native Art, Shoe Art, Face Painting, Sketch Swap, Installation & Story Board. Students from Grades 6 to 12 participated in the fest. Other schools that participated included; Oakridge International School, Deccan International School, Bangalore International School, Greenwood High, I Can The Learning Centre School, Mysore and many more. Chiaroscuro 2017 witnessed art enthusiasts coming together to explore their artistic abilities and sensibilities; they demonstrated their unique perceptions, reflections and knowledge. They participated in various competitions, workshops, art walks and gallery showcases. The community doodle was one of the major highlight for the event, where the students, faculty and staff together was doodling on the huge canvas. Amidst the lively atmosphere of canvases and cardboards being painted, a workshop on Character Design for Animation by Dr. Leonardo Beltran, a globally renowned name in animation and founder of Dr. Beltrans School of Animation & Visual Wonder, Bangalore, was held. There was also a Functional Design Workshop by Prof Monika Bijlani, faculty, Indian School of Design and Innovation, Mumbai. Ms Aarohi Singh, a passionate artist from Bangalore enriched students in her keynote address. The International Knowledge put up an information desk where they shared information on US University programs related to Art as well as to answer any general questions they may have about university admissions, program options and scholarship availability. Sublime Galleria showcased self taught artist A V Ilango’s art collection at the fest. “We are delighted to host our 5th Annual Inter-School Fine Art & Design Festival and Competition – ‘Chiaroscuro 2017.’ It was heartening to see more than 100 art enthusiasts from various international schools across the city being supported and encouraged by their schools to pursue their passion and interest in the Arts. It was exciting to see students exhibit their competencies in aesthetics, communication, language, business and international mindedness. We are so pleased to see students enjoy and construct their learning through the exploration and ideation of various aspects of art and design. Chiaroscuro is a mosaic of creativity and culture coming together to form a beautiful experience. In 2018, we hope to see more schools support their budding art students and encourage their participation in this festival”, said Mr. Saad Sait, Executive Director, Legacy School Bangalore. Chiaroscuro as the fest is called, refers to the use of light and shadow to create the illusion of light from a specific source shining on the figures and objects in painting.